On Sunday, 12th March, 2017, the C. P. Ramaswami Convention Center was filled to its full-capacity with a crowd of study-abroad aspirants attending Galvanize’s Global Education & Alumni Connect event. 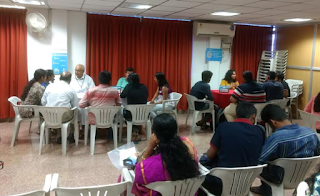 Speaking to the audience, Ms. Pavithra, the Founder of Galvanize Test Prep, who completed her Masters in Engineering from Stanford University on full Scholarship, gave valuable insights to students on building their profile for studying abroad and reviewing their approach to getting into top universities. She emphasised Galvanize’s focus on helping students through a very personalised approach which combines the expertise of world-class faculty with high-end analytics and an adaptive learning model. Mr. Rishabh Goel, an Alumnus of London Business School, who is also the national Head for Prodigy Finance, addressed the gathering as well. His presentation covered various aspects of studying abroad and the Prodigy Finance approach to student loan financing for top universities. In addition, the event also had alumni from noteworthy institutions, such as University of North Texas, Duke University, University of Wisconsin Madison and Thunderbird School of Global Management, interact with students and parents. The event also hosted University representatives such as Mr. Krushnakumar, Indian Representative for Illinois Institute of Technology. The event provided participants a broader understanding of study-abroad options as well as the impact of self-paced learning, recommending Galvanize’s platform as a viable option for aspirants. To receive more updates on future events, follow Galvanize Test Prep on facebook.com/GalvanizeTestPrep and try out their free Mobile App.